I love Snickerdoodles. 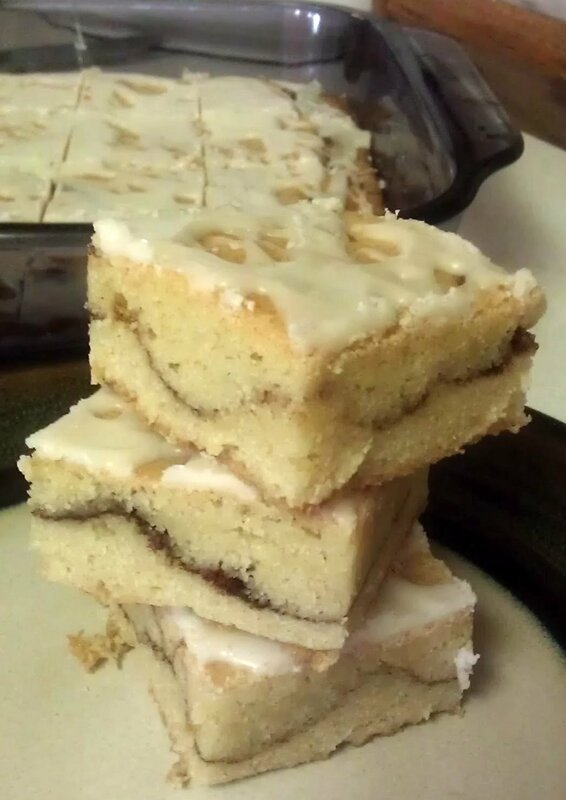 I don't make them very often, but I love them, so when I found this recipe for Snickerdoodle Bars, I knew I had to make them. And since I needed something to take for a potluck, it was the perfect time to try them. Spray or grease bottom only of a 9x13 pan with cooking spray. In large bowl, beat butter on high until creamy. Beat in sugars. Gradually beat eggs and vanilla into sugar mixture until combined. Combine flour, baking powder, and salt. On low speed, beat in dry ingredients until combined. Spoon half of the batter into pan and spread evenly. Sprinkle the cinnamon filling mixture on top, and drop the rest of the batter by teaspoons on top of the cinnamon filling mixture. Bake 20-25 minutes, until golden brown or until toothpick inserted comes clean. Let cool for an hour and then drizzle the glaze over the bars. OK, the recipe means use an electric mixer, and I'll probably do that next time. This time I wasn't paying attention - and my husband was on the phone - so I ended up just mixing the batter up with a wooden spoon. It turned out fine, but I'll probably try the mixer next time just to see if it makes a difference. If nothing else, it will save my arm! The only other thing I changed is that I cut the sugar down just a bit, using 1 cup granulated instead of 1-1/4 cups. Yes, I know, cookies or bars are supposed to be sweet, but they don't always have to be so sweet. Anyway, the batter is quite thick, so it takes a bit to spread it in the bottom of the pan and to drop it over the cinnamon filling - but it's worth it! (and maybe using a mixer will whip it up better and make it easier to spread? maybe) These are so yummy. 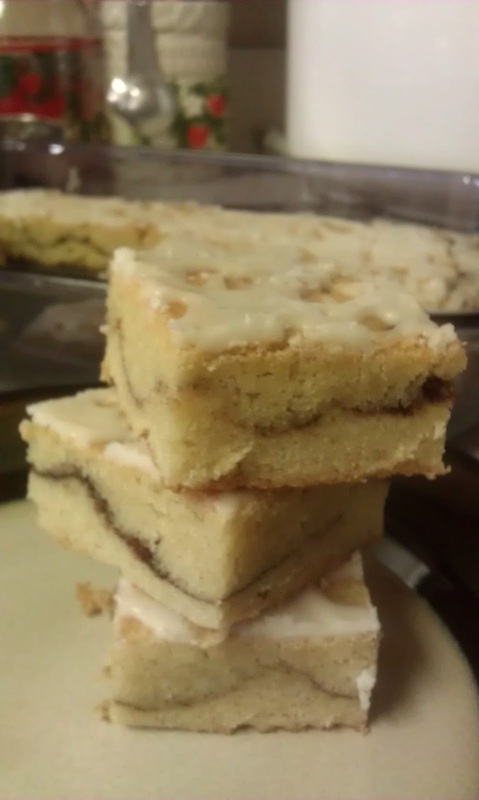 You get the sweet cookie and cinnamon goodness of Snickerdoodles in a soft bar. The cinnamon sugar is just in the middle instead of on the outside, and the glaze adds just a little something extra. I took these to share today, and I think they were a hit. I did manage to bring a couple home, but they didn't last long. Guess I'll have to make some more. Soon.